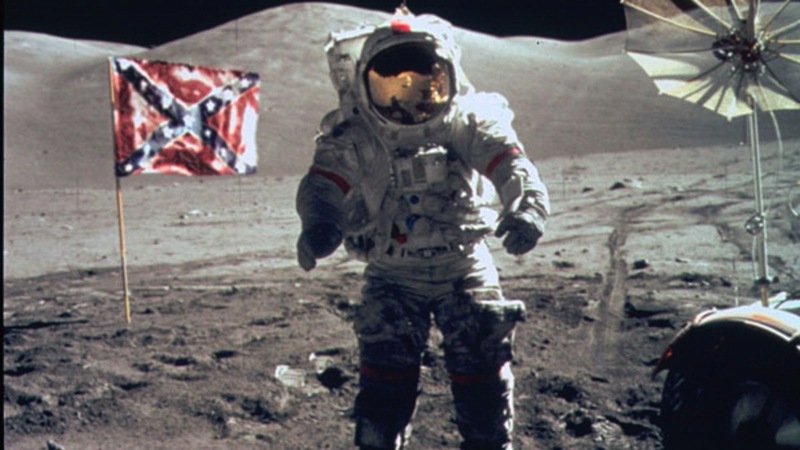 “Sober science fiction, Kevin Willmott’s mockumentary CSA: CONFEDERATE STATES OF AMERICA posits a parallel world in which the South won the Civil War. No allegory here: CSA takes the sober form of a British documentary broadcast on Confederate Television, interspersed with ads for Confederate Insurance, radio-controlled shackles, and Niggerhair cigarettes. “One can only imagine what SCTV in its prime might have done with this conceit—especially since, in CSA’s alternate universe, “red” Canada has become a black Zion, as well as the cradle of all positive American culture from Mark Twain to Elvis Presley. Actually, CSA takes off on Ken Burns’s The Civil War, and Willmott has the visual rhetoric down—if not the maudlin music and lugubrious readings. Willmott is obviously a student of the medium. In addition to talking heads and scanned documents, his compilation includes fake education films, a faux D.W. Griffith two-reeler ( The Hunt for Dishonest Abe, with the fugitive president disguised in blackface), and a late-’40s thriller, I Married an Abolitionist. “As counterfactual history, CSA is more detached than something like Philip Roth’s The Plot Against America. Willmott, who has written numerous documentaries and is a professor of film studies at the University of Kansas, maps an initially plausible trajectory (and even postscripts his movie with footnotes). Having convinced Britain and France that it is fighting for freedom and not for slavery, the Confederacy enlists powerful allies and routs the Union—then moves south to establish the equivalent of a Latin American co-prosperity sphere. Meanwhile, the North is wooed back into the fold with tax rebates for businesses buying slaves. Willmott’s imagined 20th century is even more polemical. To cure the Great Depression, the CSA revives the slave trade, allies itself with Nazi Germany, and launches a sneak attack on Japan. "Sheer genius in its conceptual simplicity."